New Asso­ciate Pro­fessor of Pol­itics Khalil Habib, after being hired this fall, has already become a popular name on campus. His classes for the spring 2019 term filled by the second day of reg­is­tration. 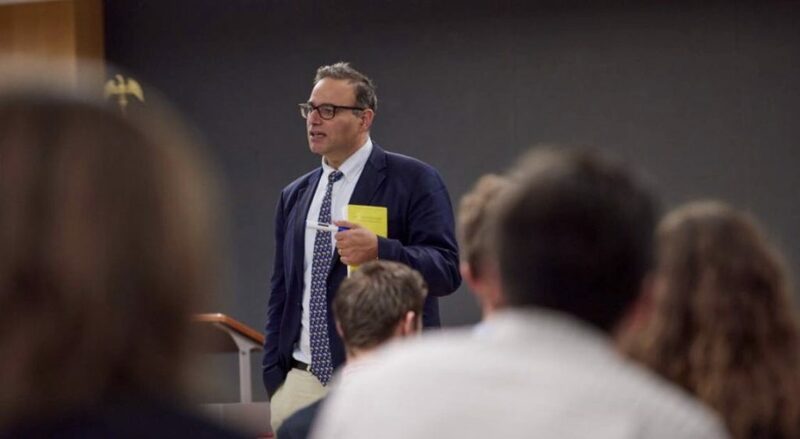 Habib, a pro­fessor from Salve Regina Uni­versity in Newport, Rhode Island, was hired this fall as an asso­ciate pro­fessor of pol­itics at Hillsdale College. He received his under­graduate degree in political science from the Uni­versity of Maine, his masters in political science from the Uni­versity of Toronto, and his Ph.D. in phi­losophy from Boston Uni­versity. Habib offers a unique per­spective to stu­dents on American political thought as he is orig­i­nally from Lebanon, and then later moved to Bahrain. He immi­grated to the United States while he was still a young child. Freshman Ceanna Hayes says she loves learning from Habib in her U.S. Con­sti­tution class because she gains a fresh appre­ci­ation for the American founding prin­ciples. “You really under­stand these founding prin­ciples in a dif­ferent way than if you were taught by someone who was born in America who is accus­tomed to and doesn’t really appre­ciate how com­pletely radical it is that the American expe­rience was suc­cessful,” Ceanna said. Hayes said she enjoyed Habib’s teaching so much that she dropped out of her music class this semester and picked up one of his 200-level pol­itics courses. She said he some­times ref­er­ences the Con­sti­tution class while teaching the 200-level course in order to help her under­stand the class better. It was Dr. Habib’s expe­rience as an immi­grant that led him to pursue pol­itics. Trying to locate the answer to the success of the American exper­iment, Habib explored eco­nomics, religion, the­ology, and even phi­losophy until he took his first political science course as an under­graduate. Besides his unique per­spective on American pol­itics, Habib also offers an enriching classroom dynamic. When asked about his teaching style, Habib said he focuses on close reading of the text and fos­tering debates and dis­cus­sions with stu­dents. Hayes said she also enjoys Habib’s sense of humor. Habib first came to Hillsdale two years ago when he gave a lecture on Islamic phi­losophy. Habib said he also really admires the Hillsdale faculty. Habib said the college’s mission was the number one reason why he came to Hillsdale. When asked about teaching a pol­itics course on Islamic political phi­losophy Habib said although he’d like to, it would be dif­ficult. Habib said working at the college was enough to cause him to move to Hillsdale, but as a native city-dweller, he was sur­prised to find he liked living in Hillsdale for the sur­rounding area as well.